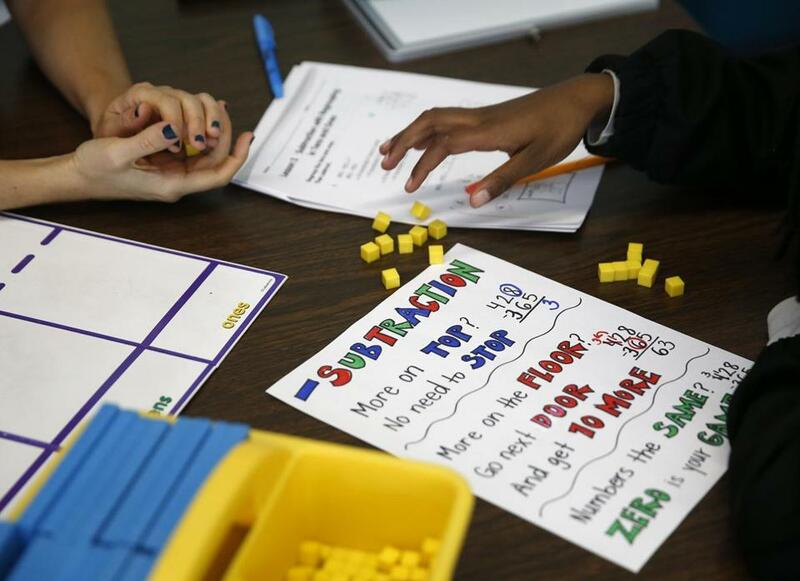 A math teacher worked with fifth-grader Gabrielle French at Bridge Boston Charter School. 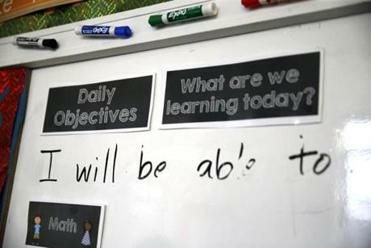 Massachusetts charter schools bill themselves in television ads as golden opportunities for disadvantaged students trapped in failing district schools, but charters often leave behind one of the most challenging student populations to teach: those who lack fluency in English. As voters decide whether to allow more charter schools, a Globe review has found that the schools enroll English-language learners at much lower rates than those in traditional systems, even as many charter schools have been stepping up efforts to recruit more of the students. One of the widest enrollment disparities exists in Boston, even though the city boasts one of the largest immigrant populations in the state. The failure of most charter schools to fully embrace English-language learners draws into question the stellar results many of these schools achieve on state standardized tests. Similar concerns have been raised about whether charter schools serve their fair share of students with disabilities, although the enrollment disparities are not as stark. During the last school year in Boston, English-language learners made up 13 percent of the combined enrollments at 19 independently run charter schools, the analysis of state enrollment data found. By contrast, students who cannot speak English fluently made up nearly a third of the Boston school system’s enrollment. The form would save time for families, who often spend hours completing multiple applications. Read: Should Mass. lift charter school cap? “We know why charter schools are not enrolling English-language learners: They are harder to teach, and they will inevitably bring down MCAS scores,” said Roger Rice of Multicultural Education, Training & Advocacy, a nonprofit based in Somerville that works on behalf of linguistic minorities. But such disparities are not unique to charters. The Globe analysis found wide-ranging enrollment levels of English-language learners among the Boston school system’s 125 schools, spanning from nearly nonexistent at several popular schools to making up the majority at more than a dozen other schools. The highest level was 84 percent. Yet the range at charter schools did not vary nearly as much. Bridge Boston Charter School in Dorchester registered the highest share, 37 percent. Critics of charter schools argue that if the Nov. 8 ballot measure passes it could create a notable divide in many cities: The more academically capable students will end up in the charter schools while those with the gravest needs will be left in district schools. Charter school leaders, however, say they are aggressively recruiting students with the lowest skill sets and note they have had success in other areas, such as enrolling high numbers of black and Latino students. “I think it’s hard to paint charter schools with one broad brush,” said Orin Gutlerner, chief academic officer at Match Charter Public School, where the percentage of English-language learners exceeds the Boston school system’s average and its population of students with disabilities is near the system’s average. Charter school leaders and advocates also say it is unfair to expect that every charter school will perfectly match the demographics of the school systems from which they recruit students. Even individual district schools, they say, don’t mirror systemwide averages. 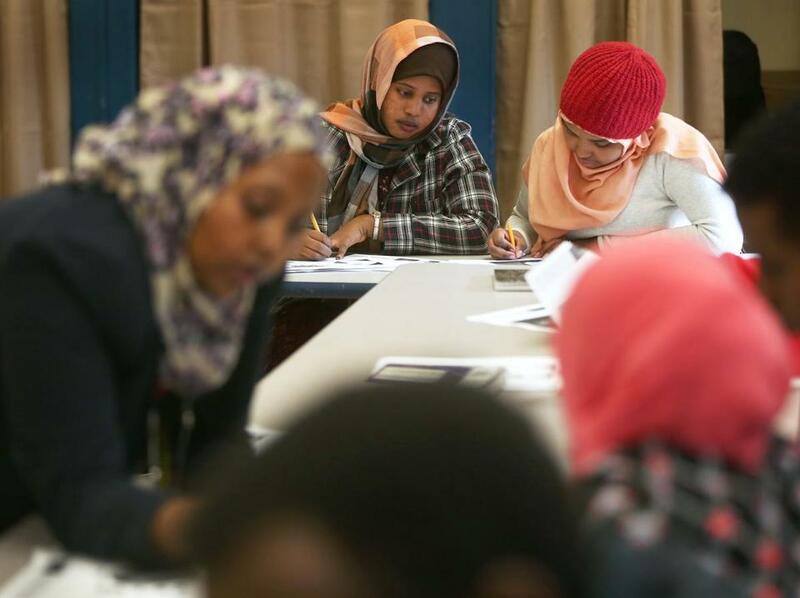 Teacher Mona Farah (left) worked with students at Boston International Newcomers Academy, a district high school that welcomes immigrants who arrive throughout the school year. Disparities in student enrollment between charter and district schools have long been a lightning rod. Governor Deval Patrick and the Legislature attempted to narrow the gaps six years ago when changing state law to allow for the doubling of charter-school seats in the lowest-performing districts. That change required charters to develop strategies to recruit, enroll, and retain English-language learners, students with disabilities, and other academically disadvantaged students at levels that mirror hometown school systems. Since then charters have increased the representation of those students by reaching out to churches and community-based organizations or advertising in ethnic newspapers, among other steps. The enrollment rates of students with disabilities are closing in on the district averages. Across Massachusetts, students with special needs made up 14 percent of the enrollment at all charter schools in 2015, compared with 16 percent at all other public schools, according to state data. But wide gaps persist among schools serving English-language learners. Part of the problem is that many urban charter schools ignored this student population for years. A Globe review in 2009 found that the 16 independent charter schools in Boston at that time collectively enrolled fewer than 100 students lacking English fluency, and six of those schools didn’t have any. The Boston charters have since made headway, serving more than 1,200 English-language learners last year, the Globe analysis found. Every school now has some. But only two schools, Match and Bridge Boston, exceeded the Boston school system’s average, while two others, KIPP and the now-shuttered Dorchester Collegiate, were very close to the district average. The other charters trailed by huge margins. Bridge Boston in Dorchester recruits students through some unlikely organizations: drug treatment centers, homeless programs, and the state Department of Children and Families. “I think every day we ask ourselves how can we remove obstacles and provide ladders to get students to where they need to be,” said Jennifer Daly, principal and cofounder. Debate persists, meanwhile, over whether students who lack English fluency and those with disabilities are better served by district or charter schools. Elizabeth Setren, a doctoral candidate at the Massachusetts Institute of Technology, found this year that both groups achieved larger gains in charter schools. But Setren’s research also uncovered some contradictions: While students in those populations were more likely to score proficient on the 10th-grade MCAS math and English exams in charter schools, they are less likely to graduate from a charter school in four years, in comparison with their peers in traditional schools. Charter school leaders have long argued their schools have higher graduation standards than district schools. When it comes to teaching disadvantaged students, many education experts say there will always be a gulf between school districts and charter schools. Under state law, charter schools are not required to enroll students who have disabilities so significant that they would need to be placed in separate residential or day programs. Yet sometimes these students wind up in district schools if the schools have enough resources to serve them. Similarly, state law creates barriers for recently settled immigrants to attend charter schools by establishing restrictive enrollment practices. Charter schools are required to enroll students through an annual lottery that typically takes place in March, often resulting in waiting lists. That one-shot enrollment period works against the transient nature of immigrant families, often making the traditional system their only viable option. And in many cases, new immigrant families arrive throughout the school year, and children may have missed classes for months or even years because of economic or political strife or natural disasters. 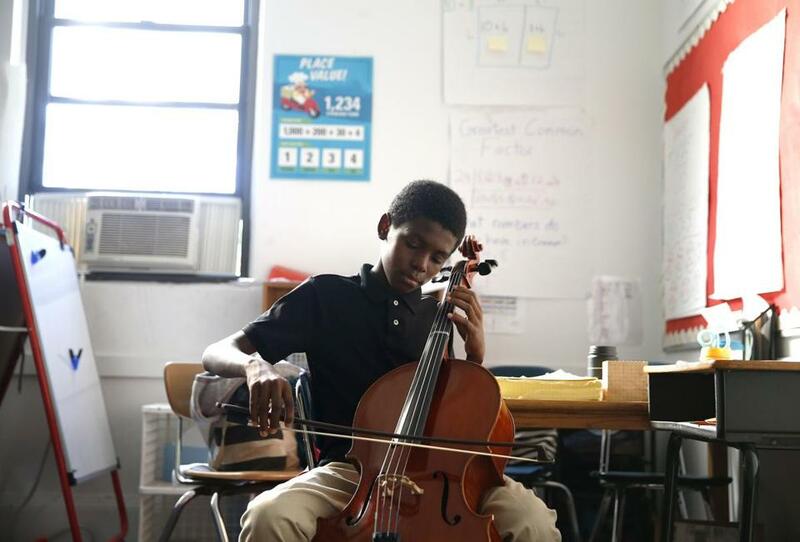 Jason Douglas practiced his music lesson inside a classroom at Bridge Boston Charter School in Dorchester. Boston International Newcomers Academy, a highly rated district high school under the state’s accountability system, caters to English-language learners. On many weeks, the school welcomes new students from far-flung countries, including two from the Dominican Republic and another from Guatemala last week. Merline Mathieu arrived at the school from Haiti four years ago at age 16 speaking little English. She had gone without an education for two years because an earthquake demolished her school in Port-au-Prince. Mathieu, who plans to study nursing after graduation next spring, credits her teachers with helping her to excel. A charter school was not an option for her; she arrived after the lotteries and never heard of charters until this year.